Drawing on historical writings about mental health consultation and on contemporary research and theory, Jonathan Sandoval lucidly explains the consultee-centered approach to consultation. The book provides an expert foundation on which to build a training program for future school-based consultants. Written for graduate students in school psychology, counseling psychology, special education, and social work, this book is an invaluable resource for mental health professionals working in schools who wish to upgrade their professional skills and grow as reflective practitioners. Individual chapters describe different stages in the consultation process; outline the processes characterized in each stage; detail useful consultant skills; review pertinent research; discuss the ethical principles underlying practice; and suggest self-monitoring questions for student consultants. 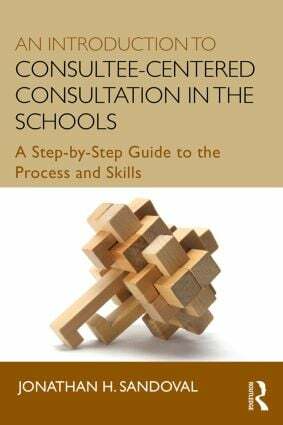 Featuring a step-by-step developmental model of the consultee-centered consultation process, this book encourages consultants to prioritize those characteristics that contribute to a consultee’s work difficulty, in addition to assessing the client more generally. By detailing this unique approach, this concise volume provides an applicable, contextualized, and strategic form of consultation, and fosters a professional-to-professional relationship distinguishable from supervision, counseling, therapy, coaching or other methods.